This beautiful Limited Edition print by John Young shows a DOUGLAS DAKOTA, Transport aircraft with three crew and can carry 28 passengers. speed 230-mph, and a altitude of 23,200 feet. maximum range 2,100 miles. The Douglas Dakota served in all theatres of world war two, The Royal Air Force received its first Douglas Dakota's in April 1941, to 31 squadron which was serving in India. 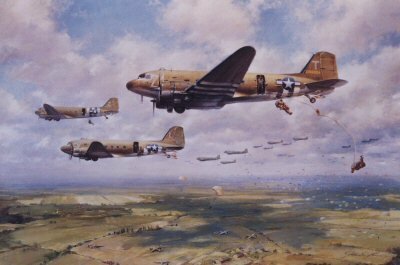 These were DC2, later DC3 and eventually C-47 Dakotas were supplied. The Douglas Dakota was developed from the civil airliner of the 1930's. The Royal Air Force received nearly 2,000 Dakotas, But many more than this served in the US Air Force and other allied countries. The last flight of a Douglas Dakota of the Royal Air Force was in 1970. You can still see Douglas Dakota's in operational and transport use across the world.